This beautiful 3 bedroom, 3 bath, 3 level villa just came up for sale in one of Manuel Antonio’s most comfortable and quiet residential, Rancho Manuel Antonio, a development with 24 hour security and paved roads in a gorgeous jungle setting just off the main road to Manuel Antonio. Casa Rio, which name comes from a year-round creek and waterfall that runs through the property, is tropical modern in style with Balinese touches throughout, including the raised bamboo ceilings and very large doors. The main floor has a spacious living area and a kitchen with granite countertops, stainless steel appliances and custom made wooden cabinets. The master suite, located just off the main living area, features a massive Indonesian antique head board and a bathroom in marble stone surface finishes furthermore easy access to the private terrace and down to the central pool and patio. The other two bedrooms are located on the other side of the main living area and are accessed from the terrace or down the stairs from the living. The two rooms share an appointed bathroom. The terrace and pool deck are ample with plenty of room to soak up the sun and listen to the sounds of the waterfall and creek. 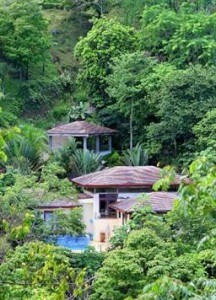 There area trails leading from the terrace down to waterfall, creek and lush jungle. The property is unbeatable for full time occupancy or as a vacation rental with good cash flow. Located on a dead-end country road, you will enjoy complete privacy with all the amenities.while offering great mountain and river views.